"Un long dimanche de fianсailles"
Keep looking for a good copy then. Even though JF was the best part of the movie for me, it's the unending quest to find him again that really hits home. I absolutely love that movie. One of my all time favorites! I always end up watching it whenever I find it playing on TV. They just don't make them like that anymore. The remakes don't even come close. *sigh* I need a time machine. I watched The Reader with Kate Winslet. Never got around to it last year, when it was out. Brilliant performances, heartbreaking tale. I have not seen this movie yet but I hope to see it soon. It was a good movie, Leslie, and heartbreaking. But now I want to watch one where I can look like that little smilie does. Whoa! lol Love him, Eugene. Yes, The Reader was great and very moving. Kate Winslet at her best, I have to say, even though she always gives amazing performances. It was also nice to see wonderful Swiss actor Bruno Ganz ("Downfall") in it. 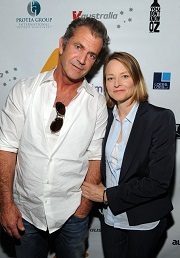 Jodie Foster is apparently a big fan of him. He once said in a German interview that Jodie has told him she owns all his movies. They met on the set of "The Manchurian Candidate" directed by Jonathan Demme. I still have to see that movie. I saw the original though and I'm sure it doesn't top Frank. There's only one Sinatra. I loved "The Hurt Locker" and "Precious" a lot. "Sherlock Holmes" was not as good as I had expected but Robert Downey jr. gave a great performance as usual. I have to say Kathryn Bigelow did an amazing job and deserved the best director Oscar. Sure, the movie is male-oriented (obviously with that topic) and the only female role in it was the very small role of the girlfriend of Jeremy Renner's character. "Whiskey School", a film that feels like a theater play and stars Olympia Dukakis, Lanie Kazan, Mary Stuart Masterson, Carlin Glynn (MSM's mother) and Gary Swanson. Directed by Peter Masterson Sr. (MSM's father). It's based on a true story of a group of eight friends in the New York theater community who confront a well-known avant-garde playwright about his excessive drinking. The whole film is a Masterson family affair. Mary Stuart's brother Peter was the cinematographer. "The Private Lives of Pippa Lee" with Robin Wright (formerly Wright-Penn), Alan Arkin, Blake Lively, Winona Ryder, Maria Bello, Keanu Reeves and Julianne Moore in a cameo role. And Zoe Kazan who plays Robin Wright's daughter looked familiar. I realized that I saw her on Broadway in June (alongside Christopher Walken). I really liked the film. Robin Wright gave a great performance as a woman who is heading toward a quiet nervous breakdown because she constantly worries about her elderly husband who already had three heart attacks. It was written and directed by Rebecca Miller, daughter of playwright Arthur Miller and wife of Daniel Day-Lewis. PS: When I watch a Robin Wright movie, I always think that in certain scenes she looks a little bit like Mary Stuart Masterson (when MSM has blonde hair). God, haven't seen Mary Stu in AGES. She looks quite different. I love Robin Wright, she's a fabulous actor! They both sound like great movies. I'll add them to my list of movies to see. Thanks. I saw "Knight and Day" the weekend it opened, and was very entertained. Great chemistry between Cruise and Diaz. I also saw an older movie on cable the other night, called "The First Monday in October." With Jill Clayburgh and Walter Matthau, it was a fictional comedy/drama about the appointment of the first woman to the Supreme Court. It was released in 1981, which is also the year Reagan appointed Sandra Day O'Conner to the bench. This film was WAY ahead of its time, especially in light of the appointments of Ginsberg, Sotomayor, and now the nomination and hearings for Elana Kagen. Walter Matthau is a great as I've ever seen him in this role. I suggest this one highly for anyone interested in this genre of political theatre. As for the age of this film.... It is set during the last days of a time when liberals and conservatives were still from the same planet. It must be aggravating for people who have given themselves over to partisan divisiveness to watch this film. I noticed there were a couple of reviews by viewers who found the film too "dated." If they'd been honest about why they found it that way, they'd have had to admit they spend too much time listening to or watching the mad disciples of the Left and Right on radio and television, who have all grown to believe their own B.S. Watched Shelter Island a few times the last couple of days. I had seen it in the theatre when it came out, and liked it a lot. After watching it on demand AGAIN, I LOVE this movie. It is so wonderfully shot, it has lots of "Scorsese special touches" with fantastic light, camera angles, slow motion etc. It is suspenseful, it keeps you guessing, the performances are fantastic! On multiple views you can watch it a whole different way, looking for clues to what you now know has taken place. Leonardo DiCaprio is SO GOOD! What a beautiful and stylish film. Ok, Tom Ford directed it. Colin Firth gives such a heart-wrenching performance of a man who lost the love of his life (Matthew Goode) to a car accident. The movie belongs to Firth. Julianne Moore has a small supporting role as his best friend. I couldn't believe the handsome young man (Nicholas Hoult) in it was the little boy from the movie "About A Boy" from 2002 (with Hugh Grant). I loved A Single Man! Saw it in the theatre when it came out. Love the sleek stylish look of the early 60's. Colin Firth is very buttoned down emotionally and in his very smart attire. Firth's performance was so good. There was one scene in particular that I thought he was fantastic! When he finds out that his lover has died, he does SO MUCH with just his face. And Julianne Moore was so decadent! I loved their relationship... See this movie! To see him live on stage on Broadway. Well, he's currently playing Shylock in "The Merchant of Venice" in NYC (the annual "Shakespeare in the Park"). He did a staged reading in 2003 (Oscar Wilde's "Salome") while I was in NYC, but silly me didn't buy a ticket to see it. Marisa Tomei, David Strathairn and Dianne Wiest ("Little Man Tate") co-starred. Leslie wrote: Watched Shelter Island a few times the last couple of days. I had seen it in the theatre when it came out, and liked it a lot. After watching it on demand AGAIN, I LOVE this movie. It is so wonderfully shot, it has lots of "Scorsese special touches" with fantastic light, camera angles, slow motion etc. I came out of the theatre with the feeling I'd seen one of the great 70's Scorsese flicks. I watched it a couple more times on a transatlantic flight, and got more of what I'd missed the first time. One of the best I've seen that has been released this year. You could see the outline of Hitchcock's nose in a couple of the shots. Speaking of Leo... I saw Inception Friday night. Wow! It is mind bending, stirring, unlike anything else I've seen. Bring your thinking cap, because you have to concentrate to follow along. It has great action, but at heart it is a very human story. I loved it! What is really great is that it will have you thinking about it and talking about it. How did they do that, what did this mean, etc. etc. Very difficult movie to try to explain, so I say, GO SEE IT! AD- I hadn't really thought about it until you mentioned it. But yeah it's interesting because that element of both films is almost identical. I won't say more because I don't want to ruin either movie for others.